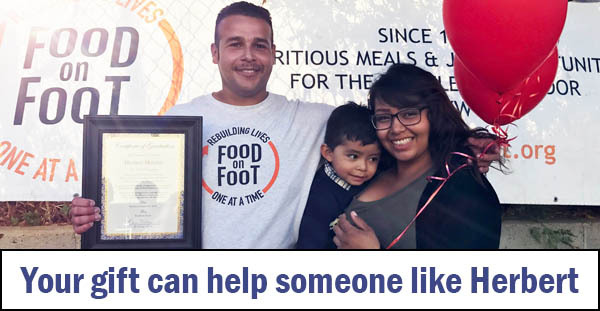 For 20 years, incredible supporters and volunteers like you have been helping Food on Foot assist the homeless of Southern California to leave the streets with a full-time job, housing they can afford, and the confidence needed to make their accomplishments long lasting. And because of the ever growing homeless epidemic in Southern California, your help is needed more than ever. Please consider giving a little more to Food on Foot this holiday season. Herbert was born and raised in LA’s MacArthur Park area. He was involved with gangs and drugs at a very young age. He found himself in and out of jail throughout his teens and early twenties. To make matters worse, he lost custody of his son, lost his job, and soon found himself sleeping on Skid Row. Because of supporters like you, Herbert enrolled in our Work for Food program! While in the program, Herbert passed a drug and background test. He demonstrated responsible work habits by cleaning the streets of Hollywood in return for food gift cards. The program also equipped him with positive values, life skills, and most importantly, the confidence needed for him to turn his life around. Herbert M. now has his own apartment and a full-time job at Palomino Restaurant in Westwood. He even regained custody of his son and strengthened his relationships with his son’s mother! When you give $100, you will help people like Herbert get ready for work and stay safe at work. With decent, hard-wearing work shoes and clothes, our clients will be able to wash dishes without slipping all over the floor. Your wonderful gift of $250 will give our clients the monthly bus passes they so desperately need. With a monthly bus pass, a person can get to a job interview or to and from work. Your amazing gift of $500 will allow us to help more people like Herbert participate in the Work for Food program. Last week we had to turn away eight people from our program. The cost per person remains high-because we are following up for months to help them change decades worth of rejection and negative behavior. With your amazing gift of $500, we can serve more people who need us. Herbert is a success story. Unfortunately for every Herbert we have, another 8 people walk away each week because we simply do not have enough staff to support them in finding and keeping a job. Please click here to help someone like Herbert earn their way out of homelessness. With your generous contribution today, you can provide the resources and high-quality care that allows people like Herbert to turn their lives around with a full-time job, housing, and confidence! This holiday season, won’t you please give $500 to help someone like Herbert leave the streets and take care of their family?